For my third restaurant week adventured I decided to visit Seasalt Woodfire Grill in Huntington Beach for some southwestern BBQ. All I can say is you’ve never had BBQ like this. Forget about your food smothered in BBQ sauce because when you come here, it’s all about the meats. 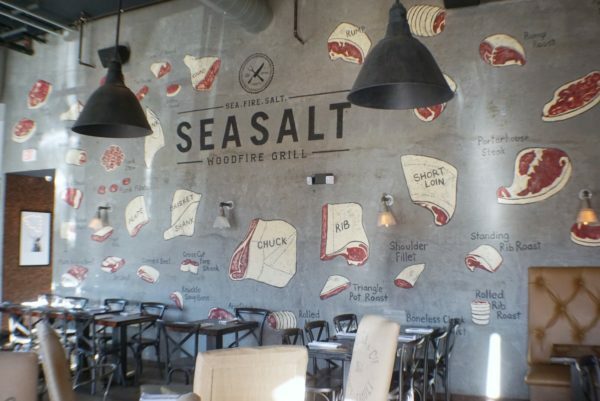 Seasalt Woodfire Grill’s name says it all. You can expect delicious cuts your favorite meats all cooked on a wood fire grill with a selection of 7 different finishing sea salts to add that extra dash of flavor. We began our dinner with two of their signature cocktails the Honey Bee (honey whiskey, lemonade) and the Grilled Pina (tequila, pineapple, jalapeno). Then we started with the cowboy caviar and pork belly mac & cheese. In case you’re curious, cowboy caviar is actually a southwest version of salsa that combines tomatoes, onions, black beans, corn, topped with avocado. It is simply delicious and the perfect way to set the tone for the type of cuisine you”ll be enjoying throughout the evening.